Have you been looking for large beach homes to accommodate the whole family for your summer vacation? Well, look no further as our lodging partners Southern Vacation Rentals have the perfect inventory of homes to suit your needs. These three Destin, Florida summer vacation homes can accommodate any size group, with space for 8-14 guests. Beach access, exciting community amenities, and fabulous locations are just some of the reasons you should book these homes today. Don’t miss out! A Coastal Cottage – The name says it all! With three bedrooms and three bathrooms, this home accommodates up to nine guests. 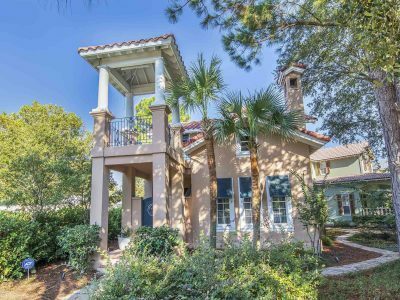 You’ll find A Coastal Cottage in the popular Maravilla community in Destin, with private beach access just a quick stroll away. This home also offers complimentary in-season beach service, with two chairs and one umbrella. That sounds pretty great to us! Griffin’s Getaway – We love this home in the exclusive and gated Caribe neighborhood, and for good reason, too! Up to eight guests will comfortably enjoy their stay at Griffin’s Getaway, with a three-bedroom main house and a one-bedroom carriage house. Plus, with two community pools and beach access just a stroll away, what more could you ask for? Summer Lovin‘ – If you ask us, this luxurious home in the Dunes of Destiny community was made for group travel. Summer Lovin’ can accommodate 14 guests with ease, with the first-floor bedrooms sleeping 10 on their own. One of our favorite features is the wet bar in the master bedroom – the perfect way to wind down an evening. Private beach access is also just a stroll away. If it were up to us, we’d spend our entire summer vacation here! Before you head to the beach, be sure to check out our Top Destin Travel Tips blog to pack smarter. We’ll see you at the beach!